Write short paragraphs to answer the following questions. 1. In what ways do people negatively affect the environment? 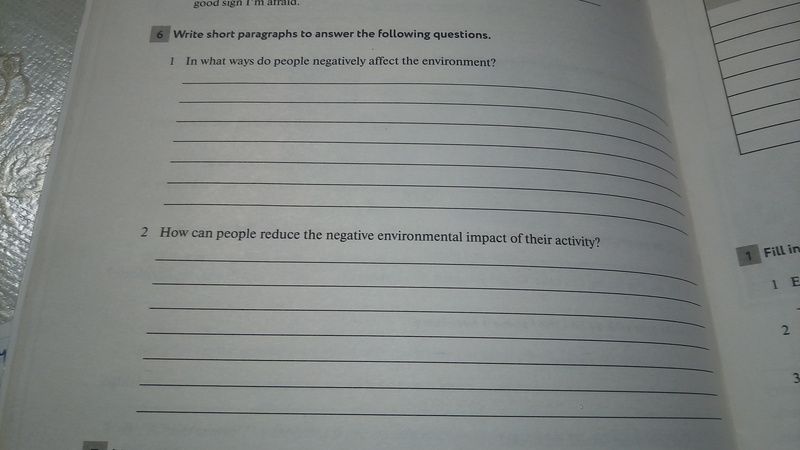 2 How can people reduce the negative environmental impact of their activity? Сроки до завтра (т.е. до 7.11.18) ! Напишите короткие абзацы, чтобы ответить на следующие вопросы. 1) Каким образом люди негативно влияют на окружающую среду? People kill a large number of wild animals. People pollute the world's ocean. People pollute the atmosphere of the earth. 2) Как люди могут снизить негативное воздействие своей деятельности на окружающую среду? People must plant new trees and shrubs. People have to sort household garbage. People must reduce carbon dioxide emissions into the atmosphere. People must reduce the number of forest fires. People must reduce the pollution of freshwater sources. People must use eco-friendly energy sources.